Why are babies scared of plants? As adults, we have a habit of reaching out and touching plants without a second thought. But babies, apparently, aren't so careless. 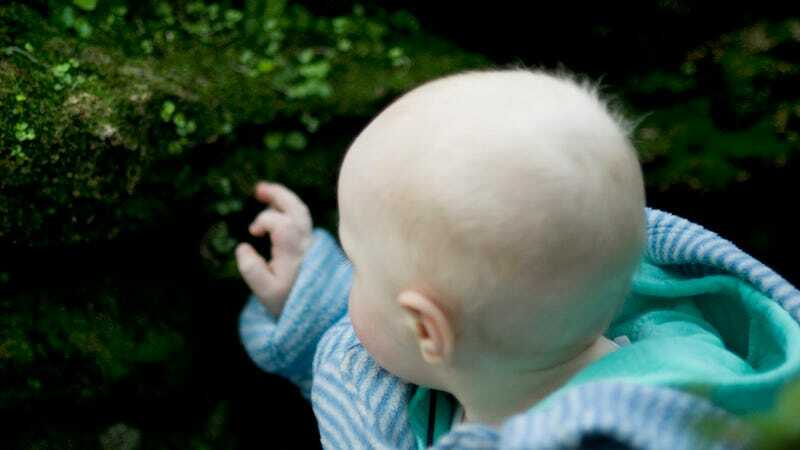 New research shows that infants have an innate reluctance to touch plants — an aversion that protects them from potential dangers, such as toxins and thorns. In our evolutionary history, we've had to deal with many animal dangers, which helped shape our innate behaviors and abilities. A recent theory, for example, suggested that we've evolved an uncanny ability to detect snakes — the earliest and most persistent predators of mammals. But animals weren't the only things in our natural environment that could do us harm. Are Humans Hardwired to Detect Snakes? "In most modern lives, plants are mostly part of the background and sort of an afterthought," said Annie Wertz, a developmental and evolutionary psychologist at Yale University. "But when you think of humans in their historically natural environment, plants were a huge part of their lives." Like animals, plants have a number of chemical and physical defenses to protect them from getting eaten or damaged. Certain plant toxins can be deadly if ingested, while plants' thorns, fine hairs and oils can damage tissues. So many animal species developed physiological countermeasures to get around plant defenses, such as vomiting or the ability to break down plant toxins. Some animals even have behavioral strategies to protect themselves from plants. "Herbivores are known to only eat little bits of unknown plants, so if they have some kind of adverse reaction, it won't kill them," Wertz told io9. Humans may also have developed ways to deal with plant defenses. Young children, for instance, are naturally averse to the bitterness of vegetables, possibly because plant toxins are commonly bitter. And some researchers have even suggested that cooking arose in part to break down plant toxins. But are infants also sensitive to the dangers of plants, the same way they appear to recognize the dangers of snakes and spiders? To test this, Wertz and her coauthor, Karen Wynn, set out to determine if babies are more reluctant to touch plants than other objects. They set up a simple experiment, which involved placing a plant (basil or parsley), an artificial plant or a fabricated object in front of an infant, while the child sat on its mother's lap in a room with no distracting stimuli. The novel artifacts, Wertz explained, had some features of plants. The researchers constructed one object from two blue cardboard cylinders. They then dyed black some artificial, fabric leaves — the same ones that were on the artificial plants — and strung them around the top of the object. "Maybe babies are reluctant to touch leave-shaped things, or maybe they don't touch things that look delicate," Wertz said. They crafted the second artifact out of green pipe cleaners to test if babies don't like to touch green objects. The object also mimicked plants' swaying movement when disturbed. After testing 47 infants, who were between 8 and 18 months old, the researchers found that the babies took, on average, 5 seconds longer to touch the plants and artificial plants than the novel artifacts. Importantly, the infants didn't have any social information about the plants, as they didn't see anyone touching those specific plants. As part of the experiment, Wertz and Wynn also gave the parents a questionnaire about their babies' experiences with plants. On a five-point scale (1 being "never" and 5 being "nearly every day"), the survey probed how often the infants see their parents handling plants, how often the babies touch plants and how often the parents stop their infants from touching plants. The infants' own experiences with plants didn't affect how long it took them to touch the plants in the experiment. Oddly, however, babies who saw their parents caring for plants more often actually took longer to touch plants, though the researchers don't know why. Given the visual differences between the fabricated objects and the plants (both real and artificial), Wertz and Wynn decided to test if the infants were just more interested in touching novel things. They also tested if the babies were more prone to touch objects that are manmade — it could be the case that the infants think anything manmade is made to be handled, and anything that's not a manmade object should be treated with some care, Wertz said. They repeated the first experiment with 44 babies, this time using the same fabricated objects, seashells (natural objects) and spoons and lamps (familiar manmade objects that the infants were allowed to touch and not allowed to touch at home, respectively). The babies weren't reluctant to touch any of the objects in this experiment, but they did take a little longer to touch the novel fabricated objects than the seashells, spoons and lamps. The results suggest that babies may have a natural aversion to plants, which protects them from the potential dangers of plants, Wertz said. And it's not that babies are afraid of the plants — instead, they instinctively employ this protective behavioral strategy when they identify an object as a plant. Of course, this raises the question: Why would the infants have touched the plants at all? "With the experimental setup, we very much stacked the deck against ourselves," Wertz explained. Specifically: The babies were in a bland room with a single object placed in front of them. Part of the reason they ended up touching the plants may be because the plants were the only thing around to touch, but Wertz is interested in seeing what happens under normal experiences. Interestingly, there is some anecdotal evidence backing up the results. "What tends to happen when I present this study, is that I have people who have kids come up to me and say, 'Oh yeah, that's right: My kids go for everything, but leave the plants alone,'" Wertz said. "Or they'll say, 'My kids put everything in their mouths, but not the plants.'" Wertz and Wynn are now testing how infants rapidly acquire information about which plants are edible. They also want to look at possible cross-cultural differences in infants' plant aversions, as well as how nonhuman primates interact with plants. Another interesting research avenue is to determine how infants identify objects as plants. "There's lot that needs to be done and a lot of gaps I want to fill in," Wertz said. Read the study in the journal Cognition. Top image via Anna Jones/Flickr. Videos via Wertz & Wynn/Elsevier.